The bloodroot gets its common name from the bright red sap that bleeds from the broken rhizomes. The Latin name implies that it comes from Canada, but its home stretches far south in eastern North America. The roots spread close to the surface to make a colony of plants, the first signs of which in spring are the flowers, pure white. The grey-green leaves follow, remaining until late summer, when they vanish until the following year. Underplanting with lilies makes good use of the space. It pays to split and replant the roots in autumn every few years. 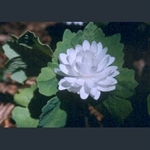 Multi-petalled white flowers followed by grey-green leaves; 'bloodroot'.